This is Duncan Obiero. He is in Class 8 and is 12 years old. Soccer is his favorite sport to play during his downtime at school. Duncan’s favorite subject is science because he likes to learn how the human body works. He hopes to become a journalist when he finishes school because he likes to write and he likes to learn about different people. He loves to entertain people and would love to use his journalistic talents to capitalize on that. This is Douglas Omgeri. He is in Class 8 and is 13 years old. His favorite class at school is Social Studies because he likes studying about economic activity. Douglas says that learning about economic activity helps him formulate a picture of other cultures. He wants to become a pilot when he grows up because he wants to discover the world. 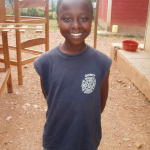 Douglas loves living at the school and says all of the teachers are very caring. This is Wycliffe Nyamagwao Okemwa. He is in Class 8 and is 13 years old. His favorite subject at school is Science because he loves learning about human anatomy. He hopes to be a doctor when he grows up because he considers this a noble profession. He feels that his interest in science will help him with this. Wycliffe’s favorite downtime activity at school is playing soccer in the field with his friends. This is Franklin Omababa. He is in Class 8 and is 14 years old. 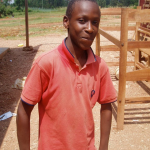 His favorite subject in school is Science, particularly Agricultural Science. He loves to learn about growing food. 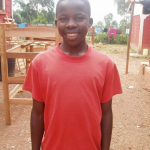 Franklin hopes to be a pilot when he finishes school because he wants to see the rest of Africa, and even another continent! He enjoys that all of the teachers at the school are social, friendly, and dependable. This is Kelvin Anyona. He is in Class 8 and is 14 years old. Kelvin appreciates the cooperation between students and teachers at the school. He likes that students can ask the teachers questions anytime, anywhere. 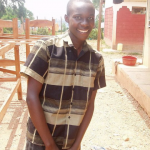 Kelvin hopes to become a journalist when he finishes school because he loves studying language arts. He says living at the school is much more comfortable than being at home because he could not play soccer and volleyball everyday at home. This is Lenah Ombaba. She is in Class 8 and is 13 years old. Lenah loves to read fiction because they keep her interested in reading and improve her composition. 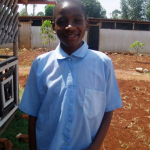 Lenah hopes to become a Neurosurgeon when she finishes school because she loves Science and helping people and she wants to combine the two. 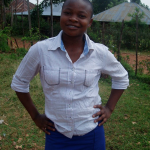 This is Faith Adhiambo. She is in Class 8 and is 14 years old. Faith is an incredible singer and never fails to inspire other kids to join in. She cites Michael Jackson and Celine Dion as her inspiration. 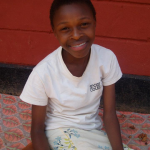 Although Faith is such a talented artist, she hopes to become a cardiologist because she wants to use her talents in Science for good. This is Caroline Bosirobi Maisibi. She is in Class 8 and is 13 years old. She loves playing soccer and loves competing against the boys. She claims playing sports “helps her to stay strong”. 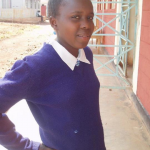 She hopes to become a pediatrician in Kenya when she finishes school because she wants to help her fellow Kenyans in need. Caroline understands that she needs to make a living to increase her quality of life, but doesn’t want to lose sight of helping people. She feels that being a pediatrician would satisfy both of these things. This is Emma Bosibori. She is in Class 8 and is 14 years old. Emma loves reading storybooks because “they can give you an outlet to some of the problems in your life, and increase your composition.” She hopes to become a cardiologist because she wants to save lives when she grows older. 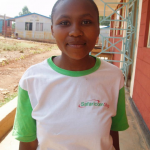 She appreciated the sponsorship the school gets because she feels safe here and says the school feels like home. This is Ann Kemunto Mogendi. She is in Class 8 and is 13 years old. She loves reading fiction and making music. She feels that the more books she reads, the better her grammar will be. 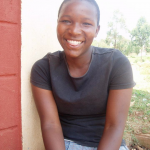 Ann hopes to become a nurse when she finishes school because she loves taking care of people and wants to capitalize on her talents in Science. She loves socializing with students, teachers, and visitors. She enjoys playing soccer and jumping rope in her downtime.